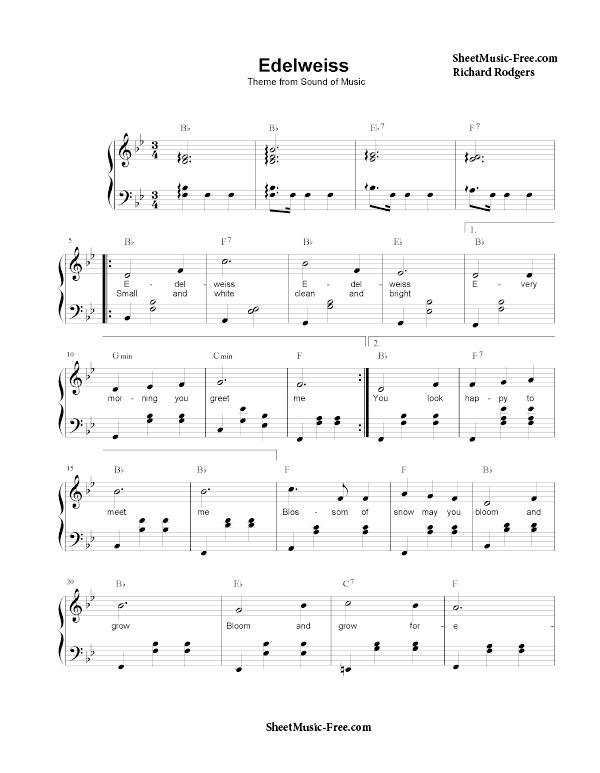 “Edelweiss Sheet Music” by Richard Rodgers, “ Edelweiss Sheet Music” for Piano / Vocal/ Chords , Original key: Bb Major, number of pages sheet music PDF: 3, Video and Lyrics song Edelweiss Sheet Music. “Edelweiss” is a show tune from the 1959 Rodgers and Hammerstein musical The Sound of Music. It is named after the edelweiss, a white flower found high in the Alps (Leontopodium alpinum). It was created for the 1959 Broadway production of The Sound of Music in the role originated by performer Theodore Bikel as a song for the character of Captain Georg Ludwig von Trapp. In the musical Captain von Trapp and his family sing this song during the concert near the end of Act II as a statement of Austrian patriotism in the face of the pressure put upon him to join the navy of Nazi Germany following the Anschluss. It is also Captain von Trapp’s subliminal goodbye to his beloved homeland, using the flower as a symbol of his loyalty to Austria. In the 1965 film adaptation, the song is also sung by the Captain earlier in the film as he rediscovers music with his children. Edelweiss Sheet Music Richard Rodgers.